Chinese City Of 11 Million Paralyzed By Off-The-Charts Smog : The Two-Way Students got a day off, traffic was slowed and the airport was shut down because of the pollution. 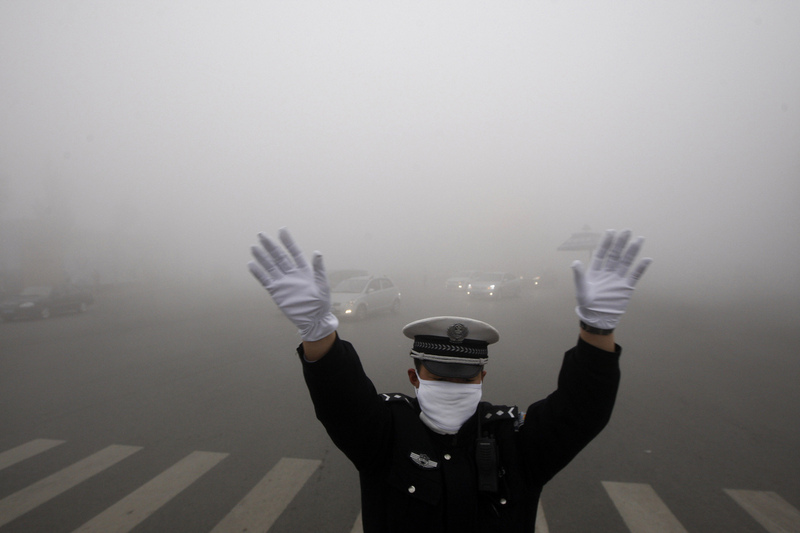 A policeman gestures as he works on a street in heavy smog in Harbin, northeast China's Heilongjiang province, on Monday. Students got a smog day, traffic was slowed and the airport was shut down because of the thick smog that developed in the northeast Chinese city of Harbin, home of 11 million people. "'You can't see your own fingers in front of you,' the city's official news site explained helpfully. In the same vein, a resident of Harbin commented on Sina Weibo, the popular microblog platform, 'You can hear the person you are talking to, but not see him.' Another resident added that he couldn't see the person he was holding hands with. "The airport in Harbin said on its official microblog Monday morning that dozens of flights had been delayed or diverted due to the smog, which it said brought visibility down to about 100 meters at 1 p.m. In the early evening, it announced that all flights scheduled on Monday had been canceled." The Capital Weather Gang reports that the index for fine particulate pollution exceeded 1,000, a level "well-beyond the hazardous threshold of 300 and, officially, 'beyond index' – as the scale stops at 500." Xinhua, the official news agency of the Chinese government, reported the pollution was in part caused by the the cold weather. Many households turned on their heater for the first time on Sunday. "The big pollutant emissions from coal-burning, vehicle exhaust and the burning of crop stalk on the outskirts and slight winds, were all factors leading to the smoggy weather, according to environmental authorities in Heilongjiang," Xinhua reports.